Almost 44 years after the birth of the Baptist General Convention of Oklahoma’s (BGCO) disaster relief (DR) ministry in 1973, DR Director Sam Porter’s dream of an all-encompassing training, equipping and mobilization (TEaM) center is nearing reality on a windy hill about eight miles southeast of Okarche. James Inman (right), pastor at Okarche, First, visits the TEaM center. Sam Porter (left) shows him around the new facility. DR volunteers who have contributed many hours of work at no cost making necessary renovations to the structure located at 7180 Northwest Expressway. 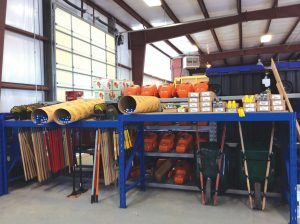 The BGCO TEaM Center is a 16,500-square-foot facility containing 5,000 square feet of climate-controlled space in which volunteers can do business, conduct training, perform vehicle maintenance and prepare to respond to disasters. 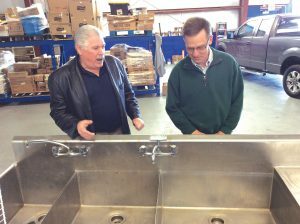 It also includes an 11,000-square-foot warehouse to store supplies. Plans also call for the construction of an adjacent 20,000-square-foot, enclosed structure to house the ministry’s fleet of vehicles. The climate-controlled area also has restrooms with showers for men and women, four bedrooms for volunteers to stay in during disasters and several office suites. That’s a big step from the present location at Boys Ranch Town in Edmond, where the ministry has been operating out of cramped quarters in a barn for many years, and where several vehicles have been parked out in the weather because of the lack of covered space indoors. The BGCO now has almost 4,000 active DR volunteers, who are organized into five geographic zones across the state. They are trained to respond quickly and provide hot meals to large numbers of people in a short period of time. As the ministry developed over the decades, several areas of service were added in addition to hot food preparation. Volunteers also provide water purification, mobile showers and laundry, damage assessment, chain saw/debris removal, mud-out, ash-out and child care. Chaplains endorsed by the North American Mission Board of the Southern Baptist Convention also accompany every team sent to a disaster site by the BGCO to provide spiritual care. The TEaM Center originally was destined to be built on a five-acre plot of land donated to the BGCO by Moore, First alongside Interstate 35. 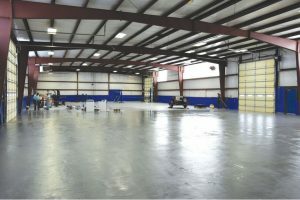 The construction bid for that new facility was $3.75 million, so Convention leaders opted to look for existing industrial properties that would serve the need, but also save money. The planned 20,000-square-foot structure is essential to protect the DR “rolling stock,” as Porter calls it. “We’ll be able to put just about everything we own inside of it,” he said. “That includes one 48-foot mobile kitchen (18-wheeler) capable of producing 30,000 meals per day; one 53-foot, refrigerated 18-wheeler to support the mobile kitchen; one 4-ton refrigerated truck with a 24-foot box and tailgate lift; four 3/4-ton Club Cab pickups; one 16-foot childcare trailer equipped with supplies for children ages birth through eight; two chainsaw trailers; one 16-foot flood/fire (Mud out/Ash out) recovery unit; one 12-foot water purification unit; one 24-foot mobile kitchen; one quick-response (14-foot) mobile kitchen and one Hybrid recovery (chainsaw, flood/fire, tarping) trailer. “Someone may say the TEaM Center is just a warehouse. Well, it’s not just a warehouse to our volunteers. 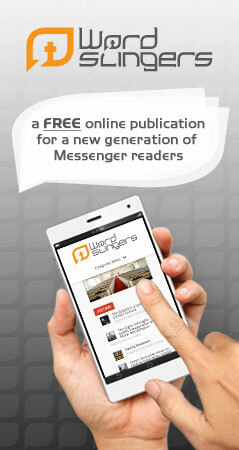 They know it will literally impact the world in an eternal way,” Porter stressed. “This is what I have experienced for 18 years with volunteers. They have skills, and you wouldn’t have had the work done any better if you had hired a contractor, because they are pouring their life into it. Most of them were skilled contractors before they were retired. Supplies, such as paper goods and food, including a walk-in freezer were scheduled to be moved to the TEaM center by March 1 from Boys Ranch. The fleet of vehicles will wait until the new building is in place, however. Marty Harkey, BGCO development officer, said financial support for the TEaM center has been excellent. “The Development Office had the privilege to work with Sam Porter, director of Oklahoma Disaster Relief, during 2016 as well as the many donors who desire to assist families in need because of a disaster,” Harkey said. “The Disaster Relief TEaM Center Campaign has wrapped up, and is now in the fulfillment phase. Major donors, foundations and corporate donors are still giving to the Disaster Relief TEaM Center. Donor meetings, fundraising dinners and the year-end mailing will continue to reap gifts for the TEaM Center in 2017.